As you age, the body naturally slows down. If you are like most executives and entrepreneurs, creating space in your packed schedule for self-care can be a huge challenge. But as a top executive, your lifestyle does not afford you the luxury of stopping. Let’s be honest, you’re a go-getter; you have no intention of slowing down. For this reason, you absolutely must commit 100 percent to lifestyle changes that allow you to be fit over 60. 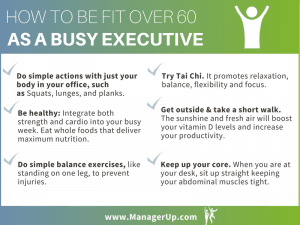 There are simple actions you can take a few times a week that will keep you fit over 60, healthy and ready to tackle the challenges that your executive lifestyle demands. 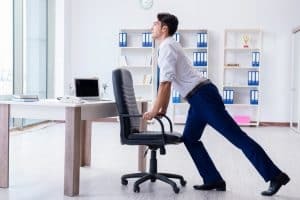 Simple actions done with just your body and a flat surface can be performed right in your office and are easy to squeeze in between meetings or even on your lunch break. Squats, lunges, and planks, when done correctly, can improve your functional mobility and core strength and are easily modified to match any fitness level or accommodate any previous injuries or limiting conditions. As you step toward being fit, remember that your muscles, joins, and tendons are not as pliable as they used to be. A strong body is your best defense against the natural trends of aging. Recovering from an injury takes far longer. Choose simple yet effective exercises in your journey to be fit over 60, such as a desk exercise bike or an elliptical under desk machine. Just because there is a six at the beginning of your age does not mean you have to slow down. You simply must work smarter not harder to maintain the strength and functionality of your body. Most bone and muscle loss occurs when aging adults trade in their active selves for a sedentary version. Being fit can ward off a host of degenerative illnesses and limiting conditions. Enjoy the benefits of a standing desk today and fortify and tone muscles, support the spine and counteract pressure on the spine discs, and improve lower back issues. You can get stronger as you age. Buck the trend of losing muscle mass and giving in to a slower metabolism. Integrate both strength and cardio into your busy week. Be mindful of eating whole foods that deliver maximum nutrition. Your couch is not calling to you; your life is calling out. Answer the call, and accept the challenge. Don’t just sit there getting old; fit over 60 is waiting for you. Standing on one leg may not seem relevant to your afternoon business meeting, but it is a fantastic way to improve your balance, coordination, and concentration. The ability to balance and stabilize will help prevent the slips and falls that often plague us as we get older. Most falls and injuries occur due to a lack of balance and overall functional strength. When you do simple balance exercises, you are forced to use stabilizing muscles that, when strengthened, assist in preventing nagging injuries like sprained ankles, twisted knees, and broken hips. 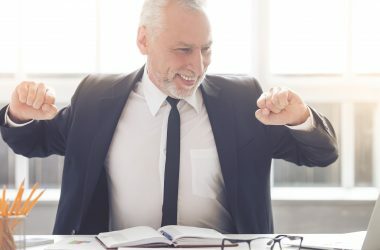 It may seem like a waste of time when the goal is to be fit over 60, but there is a good reason these series of low impact, slow movements and breathing patterns are catching on around the world, according to the Harvard Medical School. Not a sweaty, heart-pumping sport, tai chi promotes relaxation, balance, flexibility, and focus. It lowers cortisol output, which is the stress hormone responsible for belly fat. Best of all, it takes just a few minutes, needs no equipment and can be performed anywhere. Being trapped in an office building all day every day can sap your energy and hinder your productivity. Consider packing a picnic lunch, and then taking a short walk afterward. The sunshine and fresh air will boost your vitamin D levels. Vitamin D improves your mood and enhances your digestion while keeping the afternoon doldrums at bay. Work productivity will increase with renewed vigor as you keep the blood pumping. Enlist the support of a friend to garner motivation and accountability as you seek to stay fit over 60. The days of doing hundreds of crunches and sit-ups until your back aches are long gone. Modern research shows that core strength is essential to overall fitness, but there are many ways for you to keep your core fit over 60 that will not damage your body and put you at a heightened risk for injury. When you are at your desk, sit up straight keeping your abdominal muscles tight as though you were anticipating being punched in the belly. Try doing some light Pilates or yoga poses for a few minutes during a break in your tasks. Keep a stability ball in the closet of your office for some quick core work when you have a spare moment. You can never get enough core work. Keeping your core up as you age prevents those debilitating back injuries that can rob you of your livelihood. To capture the concept of fit over 60, the goal for any busy executive should be to maintain functional strength and flexibility while reducing stress and preventing injuries as well as other limiting health conditions. Bottom line: don’t stop moving. Comment below to share how you are rediscovering your vitality as you harness the power of being fit over 60. Start your path to health & success now! Get free, exclusive tips in your inbox to become a healthy manager. COPYRIGHT © 2018 MANAGER UP. ALL RIGHTS RESERVED. Download this free e-book to learn powerful strategies for healthy productivity and business success! ManagerUp will use the information you provide on this form to be in touch with you and to provide updates and marketing. ManagerUp complies with the Regulation (EU) 2016/679, 27 April 2016 (General Data Protection Regulation). We will treat your information with respect. Do us a favor and click "Accept" ? To alter the types of cookies we use click Cookie Settings.